December | 2013 | This is Ashok. Paul Krugman notes that persistent unemployment hurts the employed as well by decreasing their bargaining power, citing the low (voluntary) quit rate as evidence. This is an interesting claim with compelling evidence – wages grow a lot faster for everyone when unemployment is low. But there’s something peculiar about the the recent recovery – it’s relatively powerless. Let me explain. Both the early and late 2000s recessions have been followed by so called “jobless recoveries” where output rises a lot quicker than employment. One would expect that this would be correlated with slower increase in bargaining power (using quit rate as a proxy) though there is no way to be sure, the JOLTS dataset we use to measure these things only goes as far back as the turn of the century. The above is a simple graph of unemployment and quit level since 2000. 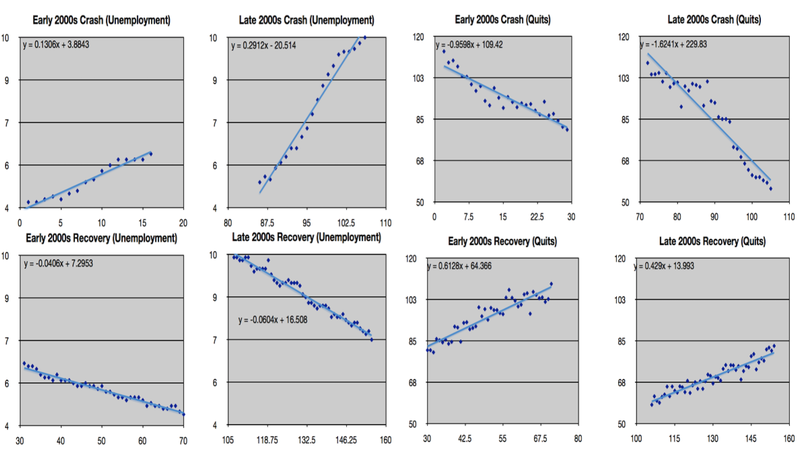 Economic theory predicts that sharp falls in output and employment should be followed by proportionally rapid recoveries (the so-called “v-shaped” recession). It is a well-known fact that the late 2000s recession hardly followed this pattern. But the way quits and unemployment differ in their respective dynamics is interesting. Even though the decline in unemployment after 2007 was hardly proportional to the crash, at least it was quicker – that is a higher absolute slope – than the early 2000s. Conversely, not only did quits fall much faster in 2007, they also recovered – in absolute and relative terms – much more slowly! If you crunch the numbers you’ll see that after 2001 unemployment fell 30% as quickly as it picked up. The same figure for 2007 is 20%. So it’s slower, but at least comparable. On the other hand, in 2001 quits recovered 64% as quickly as they fell whereas for 2007 that figure stands at an anemic 28%. Quits after 2001 picked up at 0.61 points (indexed to 2007) every month, but only 0.43 points in 2007, despite the much sharper crash. Some of this is not surprising. While a deeper recession would normally be followed by a deeper recovery, there are limitations on the extent to which this relationship can hold, especially noting second order effects of hysteresis and market inflexibility. But some of this is definitely surprising. Using the figures above, unemployment recovered almost 70% as quickly in 2007 as it did in 2001. Without some important structural changes, that figure would be in the same ballpark for relative quit recovery, which only stands around 40%. Qualitatively this means the willingness of workers to quit their jobs is far less than the unemployment rate would indicate, even using the standards of the 2000s, which weren’t by any measure amazing years for labor. If JOLTS went as far back as the Clinton years we would probably see an even stronger relationship between quits and unemployment, something that’s falling apart. So now I should answer the proverbial “what does this mean”. There are a number of candidate explanations. Loyal readers know that I’m not hostile to a partially structural read, but even that can’t explain everything, because structural arguments generally accept that unemployment rate (as opposed to employment level or participation rate) is a broadly accurate read of the economy, and that much of labor force exit is due to an aging population (or technology, or whatever). I haven’t looked at the numbers, but if we looked at the above data using employment-population ratio instead of unemployment, the late and early 2000s may not look so different. Ultimately if we are to believe that the structural power relationship in the labor market has not changed noticeably since 2000, unemployment rate grossly overstates the pace of labor market recovery, and the Fed should not even be thinking about tightening of any type. On the other hand, to the extent that unemployment rate is a good gauge of overall labor market health, workers have seen a pretty substantial fall in their bargaining power since 2000 (and remember this is independent of employment levels, unless there are some severe nonlinearities in the data). Another explanation comes to mind, though given the magnitude it is unlikely. Tyler Cowen notes that future inequality will likely be tolerated without Occupy-esque discontent as an aging country likes stability and calm. It may similarly be the case that older workers are less likely to quit their job as that implies an abrupt shift and uncertainty. Job changes may also require intrastate relocations, something else that has declined over the last few decades (though there’s a bit of chicken and egg, here). All are pretty harrowing tales for American workers, though in the long-run the former is preferable. The growing unwillingness of workers to quit places strong disinflationary headwinds in the economy as the ability to hit a wage-price spiral becomes much more difficult. Edward Lazear and James Spletzer also estimated that low churn (of which quits are a big component) cost the US economy $208 billion dollars this recovery. More generally – and in this arena I have no expertise; I turn to leftists like Matt Bruenig – this has social consequences by placing a subservience of labor to capital. I’m generally wary of such distinctions, and it’s unclear that any of the proposed solutions like higher minimum wages and stronger unions would make much of a difference – but the possibility exists and it is important. The powerless recovery is freaky. We are possibly seeing a greater dependence on employment when tight labor markets are a thing of the past. Ezra Klein’s remarks on inequality led to a pretty rich discussion, for the most part, disagreeing with his proposition that inequality isn’t the defining challenge of our time. His response today is great, making a clear – and agreeable – case that full employment is the most urgent problem facing policymakers today. The problem, I think, is that this still conflates importance with urgency and that which implies the former most certainly does not so the latter. Most of his recent post is correct. Unemployment is depressing median wages and absolutely nothing is more important right now than job creation. Within the general rubric of “inequality,” income inequality gets a whole lot more attention than wealth inequality. But wealth inequality is much more concentrated and, in various ways, much more dangerous for the social structure. In particular, it’s wealth inequality that really ossifies social mobility. The children of the top one percent only occasionally manage to match their parent’s incomes. But they often receive massive inheritances that grow over time, installing them atop the economic ladder and giving them a political reason to fight like hell against progressive tax policies (the Walton family is a good example here). And this kind of inequality doesn’t have any of the salutary benefits of income inequality: Massive inheritances don’t make people work harder. They give them a reason to never work very hard at all, and to try to influence public policy so they never have to work hard in the future, either. Of course, the wealth Gini is at any given moment in time “worse” than the income Gini, but that’s like comparing apples and oranges. To consider why think about how wealth and inequality thereof accrues: savings and investment. At any arbitrary level of income inequality, wealth inequality will increase, with a higher propensity to save among the rich as the first order effect (and capital gains as an important feedback). 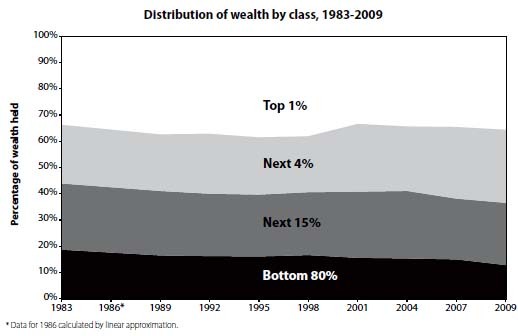 It’s pretty shocking how static wealth distribution has been, then, given the increasing income inequality. It’s difficult to argue then that wealth inequality – which is hardly a changing feature, unlike income – actually matters for political process in the way Ezra suggests. As disgusting as the Walton family’s politics might be, they have if anything only ossified the existing wealth inequality, without any first order effect on income (as Ezra points out, why should useless trust fund babies care about income taxes when they aren’t actually doing anything productive enough to earn seriously). Arguing that it is important that wealth inequality ought to be more important by arguing that wealth inequality engenders policies to protect wealth inequality is begging the question. A focus on wealth also obscures monetary policymaking. Quantitative easing almost certainly increases wealth inequality, though there are good reasons to believe it improves income inequality (which over the long run would decrease wealth inequality… as you can see the interplay and economic dynamics are complicated to say the least) through a tighter labor market. In fact, one reason why monetary policy over the past decade did not increase wealth inequality as much as it could have is America’s expensive, pro home ownership programs like interest deductions and guaranteed loans. In a freer real estate market – one that many economists agree would be more efficient and fraught with less moral hazard – it is likely that homes ownership would be more concentrated, with much of the middle class renting from the rich. The easy money policies of the early and late 2000s, then, would have increased wealth inequality that much more. But that would not mean anything, and should not be the basis for any policy action. On the other hand, some important things are changing and wealth inequality may be more important in the future. As Piketty and Zucman document in a must-read paper, the wealth-to-income ratio in rich countries has increased substantially over the Great Moderation challenging conventional economic wisdom that this ratio is constant over time and reflecting lower population and productivity growth coupled with higher savings. However, their data is a lot less remarkable for the United States, where population growth is relatively robust, and savings low – the ratio has increased though not markedly so. Still, in an age of automation and increasing capital shares, the increasing ratio could become an important economic issue. Ultimately, though, capital income is still income. The return of wealth is not as much a reason to worry about wealth inequality but for capital tax parity with income – something progressives worried about income inequality have long advocated. The importance of wealth inequality boils down to this. It is difficult to argue, as I think Ezra does, that this matters in and of itself because wealth inequality has historically been around as high as it is, and few would have suggested this is a problem a few decades ago. Suggesting that high wealth inequality begets more wealth inequality is not just assuming the conclusion (that this is bad) but also is not empirically guaranteed (though I am less convinced of this, data show that the 1%/median wealth ratio has increased substantially). The arguments that wealth inequality matter for other reasons go back to some form of income inequality, usually distribution of capital gains. These are central to debates about inequality of all stripes. Wealth is not at all irrelevant, though. Flows matter more than stocks but when we as a society realize that deeper safety nets and education for the poor are important, we’ll tax the flow of inheritance every year instead of income which is scarce relative to the flow of wealth. Ezra Klein argues that inequality should not be shaping political discourse to the extent that it is. That’s probably true. But this article misses a few important points and, I think, doesn’t do the best job of characterizing the progressive argument. Or maybe we’re in agreement, and I’ve misunderstood – it’s hard to tell (though, given that I’m commenting on a Wonkblog post, more likely than not). A quick preface. Arguing that “unemployment and growth, not inequality, will be the defining problem” of our age is dissonant beyond the mutual causality (which is not very well founded) Ezra acknowledges simply because inequality is only a problem when growth is a problem. I don’t remember much about the 90s – intellectually, my generation really was born of financial crisis and political gridlock – but it’s hard for many Americans to think of the Clinton era, despite rising inequality, as a bad time due to high rates of job creation and growth. Polls suggest that perception of inequality and class warfare are worse than usual – vindicated by both the Occupy and Tea Party movements. As long as your income is growing – even if not nearly as quickly as financiers on Wall Street – it’s not hard to foolishly convince yourself that you have a same shot at those riches as the millionaire next door (Americans ubiquitously believe that equality of opportunity is a worthwhile goal). But when the music stops the story changes. Inequality is a problem, politically and economically, precisely because of secular stagnation. That, by itself at least, does not mean inequality is the defining problem of our age. It’s worthwhile dividing problems into two categories: those that are urgent, and those that are important. It is also worthwhile noting that usually one does not imply the other. Let me be absolutely clear: the most urgent problem facing America today is unemployment. This is almost incontrovertible. Both progressives arguing that inequality is and conservatives arguing that deficits are urgent do discourse a disservice. But candidates for the most important problem are more diverse still. Existentially, there is little more daunting than the tail risks from climate change. If the United States, China, and India do not legislate strict carbon taxes into law within the next two decades many other debates will become moot. Less apocalyptic, but important over the long run still, are rising inequality and secular stagnation. But it is difficult to argue that growth is a uniquely more challenging problem than inequality. It is easy – and right – to rail against the stale debate that we ought to tax the one percent five percent more (as if that will solve anything), but (contra Dylan) most solutions to unemployment will actually increase both opportunity and equality. The Wonkblog post suggests most of the connection between inequality and growth come from a persistent demand shortfall resulting from income earned by those with a higher marginal propensity to save. And while this has dominated some progressives corners of the blogosphere over the past week, it’s hardly the most important link between the two. Curing unemployment results in a tighter labor force which eventually results in what economists call a wage-price spiral as workers expect inflation to rise, and demand higher wages, forcing inflation to rise. As the unit cost of labor rises quicker than that of capital, we would hopefully see a return of labor share and general prosperity. The best way to increase wages, employment, and equality would be for the government to contract labor supply by hiring all unemployed workers who want a job in menial, labor-intensive positions. This would increase inflation, reduce the primary balance, and force unskilled wages to increase more rapidly than cost of capital (human or physical). Most things we do to reduce inequality would also increase growth, at least in the economic model (thematically, not rigorously) employed by proponents of secular stagnation like Paul Krugman or Larry Summers. The best way to deal with inequality would be to increase some form of handout, financed by a deficit, which would aid inequality and growth at the same time. In fact, other than the second-best solution of the minimum wage, it’s not easy to think of something that – within the Keynesian model many people in this conversation favor – would reduce inequality without improving growth. Neither inequality nor growth are the “defining problem of our time”, but they are born of the same ill, low aggregate demand. In times when demand is high, society will tolerate much more inequality and growth will be limited by supply-side factors. In fact, that’s the reason growth per se is not a problem of our time. If we were experiencing inflation despite low growth rates, it is difficult for the wonks of the world to do anything about it. That is the realm of science and engineering. But we’re not there yet and, as far as I can see, the most convincing arguments suggest that both inequality and growth are first cousins. You would really need a Republican to find a way to better one without bettering the other (and, arguably, the farm bill is a perfect example to this effect). Cardiff Garcia has a good rundown on the minimum wage debate. He’s looking for someone to persuade him either way, and I’ll try to explain my qualified support for a minimum wage. For many, the debate is about the relative value of a minimum wage, which is theoretically inefficient, against wage subsidies which are not. However, as Paul Krugman pointed out earlier this year (though this is nothing new) the minimum wage and Earned Income Tax Credit (EITC) are really compliments, at least to the extent your goal is ensuring workers and not employers capture the benefits. Here’s the pith in just a few sentences. As far as welfare goes, the government should not really be concerned about the wage paid by employers as much as the wage received by workers. If we decide that everyone needs $15 dollars an hour to live a comfortable life, then the government should not require that employers pay at this level, but promise to cover the differential between the market clearing rate (for unskilled laborers). The problem is labor supply is not perfectly inelastic, so this becomes subsidy for employers who can pay less. There’s another problem with the EITC – it’s somewhat procyclical. There’s some econometric evidence to this effect, but it’s pretty easy to see that a program dependent on employment is not very countercyclical. This is not a problem per se but the marginal value of government spending – not just in increasing the welfare of the poor, but in moderating business cycles – is much higher in recession. What about when the wage profile for low-skilled workers is sloping downward over time? One would expect the opposite result to hold, namely that employers are less likely to hold on to workers when confronted with a mandated wage increase. For much of the 1990s, the labor market for less skilled workers was in decent shape. Since 1999 or so often it has been in bad or declining shape, excepting the “bubbly” years of 2004-2006. Therefore a minimum wage hike today would be more likely to boost unemployment than the minimum wage hikes of the past. And that unemployment is more likely to be long-term, corrosive unemployment than in previous decades. I do understand that a minimum wage hike, in the eyes of some, is more “needed” today, perhaps for distributional reasons. But can we admit it is more likely than average to lead to additional unemployment? There are many ways to make a minimum wage procyclical, but a simple heuristic might be keeping the portion of the workforce on minimum wage constant over time. That means when the labor market is tight the minimum needs to be raised to keep the level constant, and vice-versa in a loose market like today. There’s a pretty good argument that a minimum wage is like fiscal stimulus the government doesn’t have to pay for, advocated most vocally by billionaire Nick Hanauer. He thinks that’s a good thing, but huge cash piles or not, a recession is precisely the worst time to ask the private sector to pay more. This would work in tandem with a wage subsidy guaranteeing some minimum income that is acyclical. In good times, the required employer pay rate increases, easing the government’s deficit. The disemployment effect during this time will be relatively negligible as per Cowen’s logic but also because inflation is higher during boom times allowing the employer to erode the real wage rate if the employee turns out to be bad. When times are bad, the wage employees need to pay falls, which increases demand for labor, and the government picks up the tabs. Sure it’s partly a subsidy to employers, but one precisely when they need it. This has the free benefit of making the EITC a lot more countercyclical. It also eases political constraints of efficient stimulus. The government can choose to make the minimum wage zero in slow times – something I’ve advocated before – which would in effect be providing free labor to employers. This sounds a lot better once you consider that at least today employers seem to think the long-term unemployed are approximately useless. A procyclical minimum wage in tandem with a wage subsidy is in effect a countercyclical stimulus program. It also directly encourages hiring in a way the standard program does not. Here’s to the market determined minimum wage. It is common to hear, in the best arguments against a higher inflation target, that the costs outweigh the benefits. For a representative example, Coibion, Gorodnichenko, and Wieland argue that within a New Keynesian model, the distortions higher steady-state inflation creates among the relative prices of goods and services are high – exceeding the benefit of avoiding a liquidity trap in the future. I don’t have much in the way of technical expertise to critique this model, though I am skeptical of the calibration – they assume that the frequency with which we will hit the zero bound in the future may be extrapolated from historical tendency. However, if the Wicksellian interest rate is on average lower now than in the past, this calibration would be optimistic. But that is beside the point. Let’s assume that the costs of inflation outweigh the benefits. How would you react if someone advised against purchasing health insurance because the cost outweighs the expected benefits. Many people pay heavy monthly premiums to avoid calamity in the event of a worst-case event. There are many models you can use to justify this insurance. Maybe costs are not linear. That is, the closer one gets to the bottom of his bank account, the more utility the marginal dollar brings. So long as the premium itself is not forcing him to dissave, it is not hard to imagine the value of insurance. Perhaps uncertainty itself is costly. This is a well-established behavioral phenomenon. Go ask a stranger whether he wants $500 in cash or $1,500 if he wins a coin flip. A liquidity trap is not perfectly analogous, but it’s not hard to see its similarity with a heart attack. While there is debate among some as to whether the zero bound binds – Bernanke in his academic research is a great example – the performance of Western economies in wake of the crisis, not to mention Japan over the past decade, suggests monetary policymakers either lack the will, knowhow, or confidence to implement such policies. Instead we get risky and untested asset purchase programs as well as forward guidance which suffers from time inconsistency and relies heavily on the credibility of a decentralized institution. We get political dysfunction and immobility. The Tea Party and Occupy Movements are at least second cousins of the liquidity trap – enough political science research suggests a bad economy engenders extremism. My point here is that including political and social costs of mass unemployment, it is not enough to say the costs of inflation outweigh the benefits. The Fed understands this, to some extent, considering its heroic effort to stimulate the economy with unconventional tools. But even assuming they worked perfectly, is the cost of removing high quality collateral from the financial system worth the benefit of a slightly lower inflation rate? This whole post is a contingency. I don’t think the costs of inflation outweigh the benefits, but I can’t construct a fancy model to prove that. It is worth asking why we target a lowly 2% to begin with. Because New Zealand did it?